Here are the biggest obstacles to market-thumping gains for P&G's stock next year. 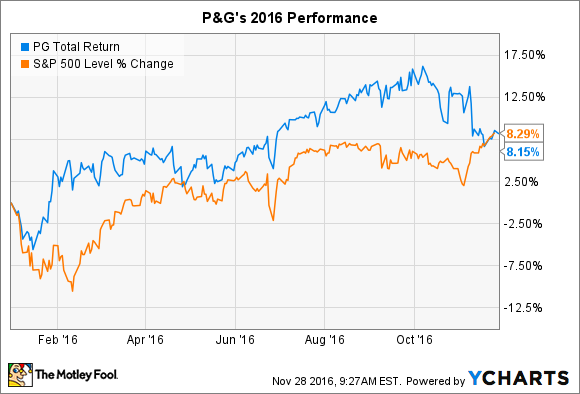 With just a few weeks to go in 2016, Procter & Gamble (NYSE:PG) shareholders are straddling the line between optimism and pessimism. Including dividends, their investment return has been almost exactly equal to the broader market. Data through Nov. 27. PG Total Return Price data by YCharts. The consumer goods giant is currently the 18th best performer out of the 30 members of the Dow this year. So P&G isn't trouncing the market -- but it's not set to finish among the Dogs of the Dow (as it did last year), either. With 2016 looking like a toss-up, let's pull out the crystal ball and consider a few reasons why shareholders might be in for a rougher year ahead. The biggest potential spoiler to P&G's 2017 is also something over which it has no control: weak market conditions. Stubbornly low demand in rich markets like the U.S. and developing ones like China and Russia held back results over the last two years. Thus, the disappointing 2% organic sales uptick in fiscal 2015 was followed by an even weaker 1% last year. Fiscal 2017 is off to an encouraging start, with organic growth improving to a 3% pace. However, the global outlook isn't great. Rival Unilever (NYSE:UL) recently warned that consumer demand weakened in many of its biggest markets. And Kimberly-Clark (NYSE:KMB), which competes with P&G's flagship Pampers brands, told investors that "we experienced a more challenging and competitive environment" in the third quarter. Both Unilever and Kimberly-Clark reported slowing growth rates and forecast another year of sluggish gains ahead. For its part, P&G held to its projection of a 2% organic sales gain in fiscal 2017. That would mark a welcome improvement over last year's nearly flat, but it's still below the 3% (or better) that P&G routinely managed until fiscal 2015. Even if demand firms up around the world, P&G's stock can still underperform if it continues to shed market share. After all, its business model depends on the company's growing at a slightly faster rate than the industries it competes in, which hasn't happened in the last two years. Many factors contributed to that poor result, but one of the biggest has been stiff competition on the value end of P&G's product lines. In shaving, for example, cheaper disposable razors and online subscription options -- such as Unilever's Dollar Shave Club -- have eaten away at Gillette's formidable market share lead. P&G believes it can turn the tide in shaving and across its portfolio through a mix of better product innovations, more competitive pricing, and increased advertising support. Investors so far are buying management's rebound plan, but they'll be understandably disappointed if it doesn't result in a better market share result next year. For most of the last two years, P&G has been working at slicing 100 brands out of its portfolio. Besides the short-term bonus that initiative delivered to shareholders in the form of huge cash returns, executives claimed that the portfolio they're left with will be easier to steer through changing consumer preferences while also generating better profits and faster growth. With the sale of 41 Coty beauty products last quarter, the brand-shedding initiative is basically done, and so investors will be looking for evidence that the transformation was a success. While CEO David Taylor and his team have cautioned not to expect a quick spike in growth, they also predicted that the remaining brands, led by powerhouse franchises like Tide detergent and Bounty paper towels, will grow at a 1% faster organic sales pace and sport a profit margin that's 2 percentage points better than before. If those improvements don't begin to materialize in 2017, investors will be right to question whether management blundered by selling off almost $10 billion worth of well-recognized global franchises. Valued at 21 times next year's earnings, P&G's stock seems reasonably priced -- if you believe the company is entering a new chapter of increased profitability and sales growth. On the other hand, if 2017 fails to deliver better operating trends, the stock could significantly lag indexes next year.